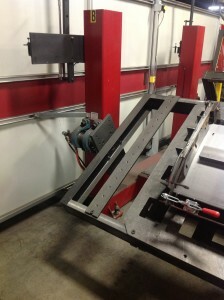 OK, here’s the scoop… In a weld or assembly fixture, the fixture components are usually mounted to a base plate. The plate might be mounted to a stationary table, or rotating table, or trunion. 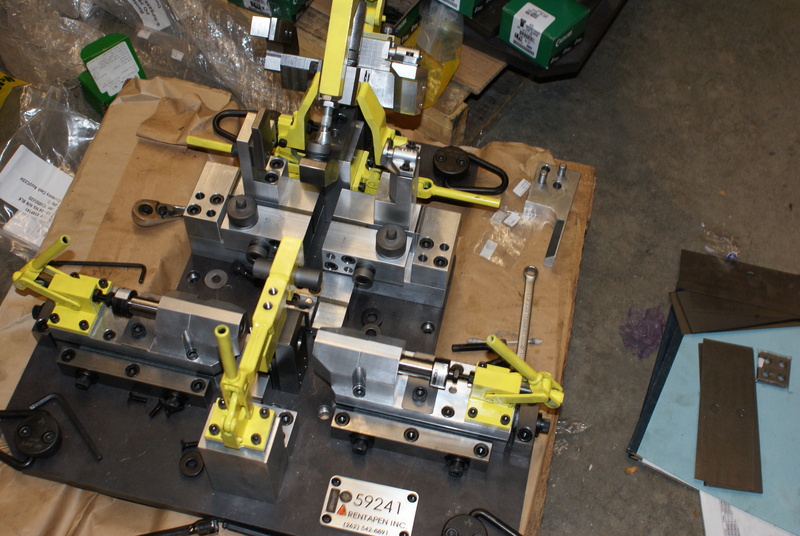 Sometimes the components are mounted right to a back bone weldment that rotates. So, after the fixture is put into place in the factory, why would it ever be moved? I can think of 3 REASONS and you probably can think or more. But it all boils down to one thing… if your base plate isn’t strong enough, it might distort slightly during transporting and then the next time it is used, the assembled or welded product is no longer the same. It may even be outside of tolerance specifications. So it is important to consider making your fixture cost effective AND strong enough to withstand being lifted, banged, and sitting in a less than ideal environment. Products have life-cycles. A rake might be the same for a hundred years. The style doesn’t change. But a motorcycle might sell a lot in the first few years and then the sales will slow down because everyone is buying the newer models. A company might build 50 wonder-widgets a day for the first year and then 20 wonder-widgets a day for the second year, and then maybe 10 wonder-widgets a week on the third year. In the meantime the product designers are coming out with a better or different wonder-widget…. Wonder-widget 2.0!!! 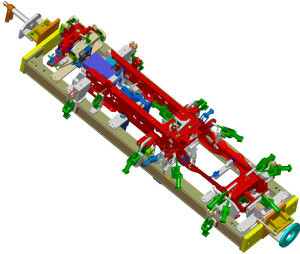 And this means that a weld jig or assembly fixture for Wonder-Widget 1.0 will need to get out of the weld cell area so that WW 2.0 can be made. The first weld fixture will go into storage until later in the week or month when the cell will be changed back to produce those few WW 1.0. that were ordered. So think about the transporting of your fixture in and out of storage. Sometimes companies consolidate facilities to save costs. Or they merge with other companies. Now the whole factory needs to be re-designed to do more. Whole weld cells need to be moved from one area to another. Can I repeat? When designing your weld fixture, think about the possibility that it will be transported by fork lift, or hook, or by hand more than once. A robot is run faster, allowing it to be used part time making Widget 1 and part time making Widget 2. The change-over needs to be fast. 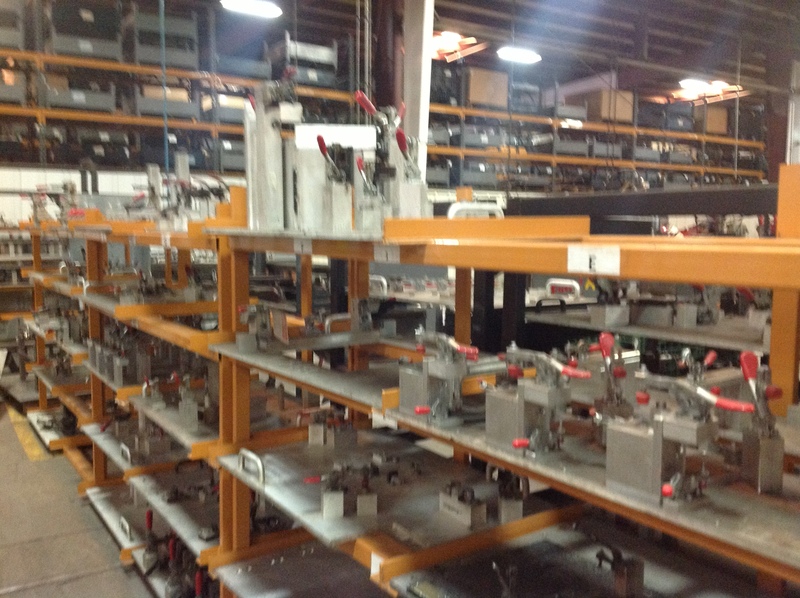 And the products produced in the fixture must be consistent before and after each change-over. This small fixture is transported by hand and has an aluminum base plate. Make your base plate thicker. The bigger and heavier the components on top of the fixture, the thicker and heavier the base plate needs to be. Most of our small fixtures that can be picked up by hand are ¾” Aluminum. But if the components on it are plenty and heavy, we need to make the plate out of steel which will distort less than aluminum during transporting. Now the fixture might be too heavy. 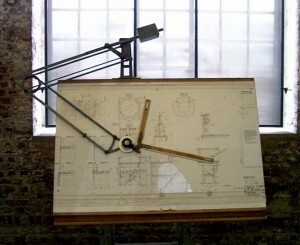 If so, you will need to design in a way to transport the fixture. Hooks for being hoisted up with a gantry or crane for example. This fixture has hooks for being lifted by chain. Add braces to the plate. Often times this is done with plates … like a 3” x ½ plate set perpendicular to the base plate. Many times bracing is done with square or rectangular steel tube. 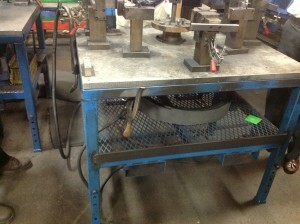 Some companies attach the plate to a welded steel tube table with fork lift tubes. The base plate and table are one. This allows for easy transport, but takes up a lot more storage space. 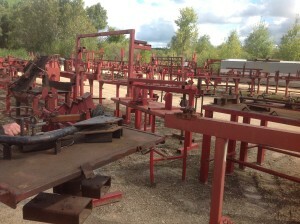 We have visited manufacturers with acres and acres of old fixtures sitting out in a field. Rusting and waiting for their next time to be used. 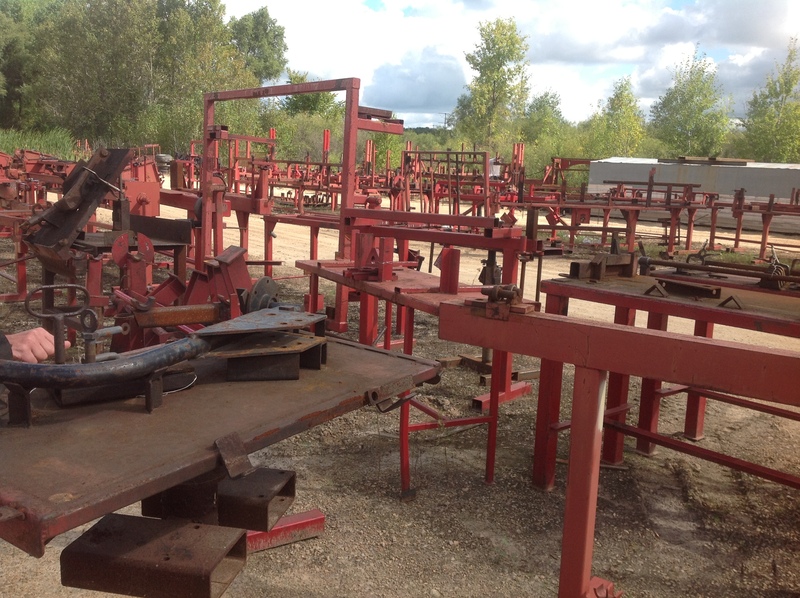 When it is time to put them back into use, they are tested, many of the clamps need to be replaced because they have rusted. But these manufacturers have found that when a fixture isn’t used very often, this is the most economical way to store it. Many weld fixtures have space in between the sections that are touching the product parts. So in those cases, often times there is more than one base plate. Each section has a label regarding its location on the trunion. 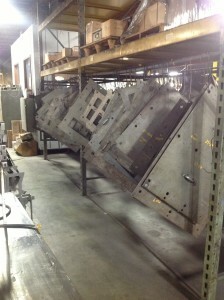 This picture shows a long weld fixture that has several sections on different mounting plates with gaps in between. 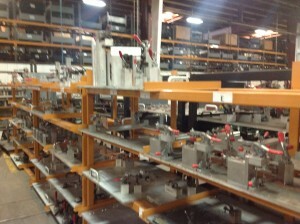 We have seen shelves and shelves full of weld fixtures in storage. Sometimes the workers just piled one fixture directly on top of another. So just as we designers need to design as if the operator of the fixture was a gorilla, we need to also design for rough handling during transporting our machine-tool fixtures. Since my last blog post Rentapen received our largest order for die-sharpening shims yet! Yippee! 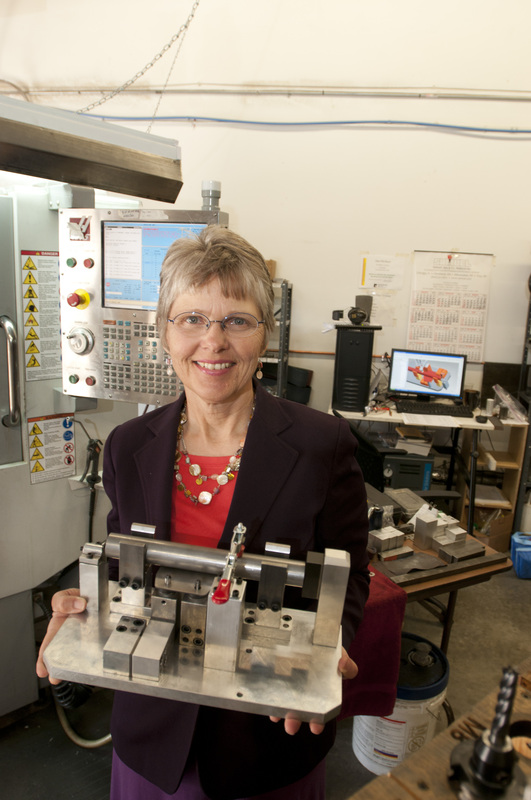 Die-sharpening shims are similar to the adjustment shims we use in weld fixture design. Only they are used after maintenance on a stamping die and require a custom 2-D drawing. 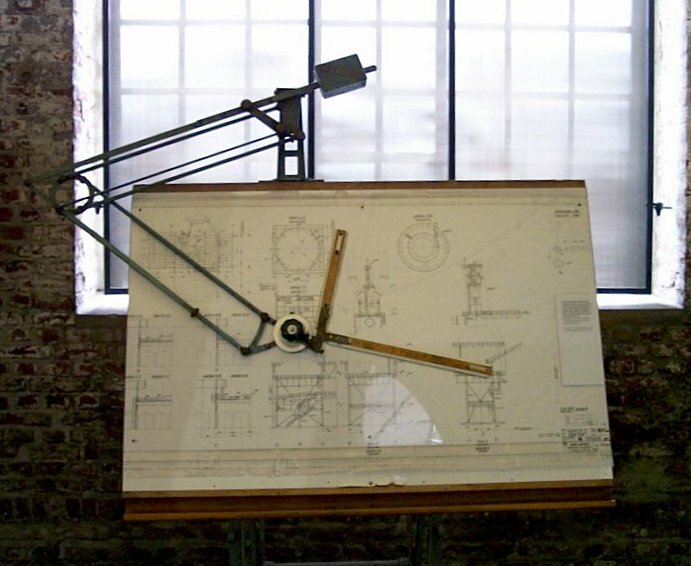 Rentapen is seeking a Part-Time CAD Drafter. If you are interested in an internship or part-time position and you have Pro/E or SolidWorks training. Check out our Ad. And send in your resume.